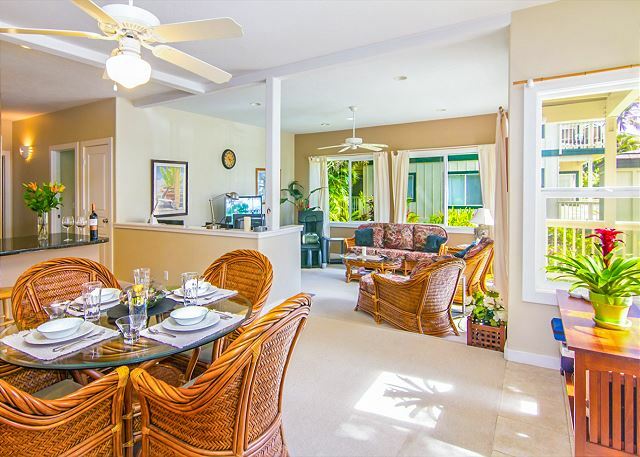 This 2 bedroom, 2 bath luxury condo features exquisite Hawaiian style furniture and décor. The black granite counter tops lends to a luxurious look to the FULLY equipped kitchen, down to the Vitamix blender for those juicers and smoothie makers. The master bathroom features a jetted tub and walk-in marble shower. The living area is complimented with a smart TV, DVD, a massage chair to help ease those tense shoulders and soothe the aching back. For the working executives, we have available a home office nook including a printer! Beach amenities are 2 boogie boards, 2 beach chairs, 4 beach towels, beach cooler, grilling tools. Bed assignments are: 1 very comfortable king bed and 2 very comfortable twin beds. 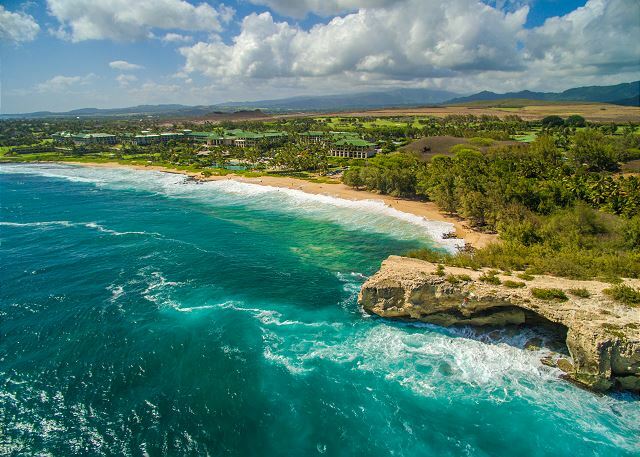 Just a ten-minute walk to beautiful Keoniloa Bay (nicknamed Shipwrecks by surfers) in front of the Grand Hyatt Kaua`i Resort & Spa and a ten-minute walk to Brennecke’s beach. As a guest at Regency #914 & RE/MAX Kauai, you'll have access to Kauai's Premier Concierge Service at (855) 665-2824 http://kauaiva.com/index.html, we will help you build your perfect vacation. We had the perfect balance of excursions and downtime. Room to spread out, generous kitchen. Staff were super helpful. I would definitely stay here again! I highly recommend it. Mike J from Tracy, CA does not recommend this vacation rental. You can't really control who's above you, but during our stay there were two different families who both had kids running around during the wee hours of the morning (5:30 am) waking us up. The ceilings must be paper thin, or maybe I just havent lived under anyone for a long time, but this was extremely annoying. Woke us up in the mornings and kept us up at night sometimes. Proximity to Poipu beach was pretty good, and the weather on the south side of the island is nice, so no complaints there, but the microwave broke on our second day there and the AC also went down. They came out and fixed the microwave the next day, so that's a credit to them. Also the parking situation is suspect. They say you have a designated spot, but there is no parking enforcement. On our last nights there was a van that parked in our spot and we had to park elsewhere. This place was an excellent vacation rental. We are a family with 2 young children and the layout of the rental was excellent. The air conditioning and jet tub was an added bonus. The walk to the beach was quite reasonable. My favourite part, though, was the massage chair! We would definitely stay here again! The Condo was great with comfy beds, well stocked kitchen, clean and comfortable in a great location. We loved being able to walk either direction to restaurants, bars and beaches. Property managers we're great to work with, Angela was always right back to us if we had a question. We couldn't be more pleased with the stay, the location and the awesome people we worked with to put it together, we definitely recommend the condo and we'd stay again if the opportunity arises. We were very satisfied with our stay. The unit was very clean, the furniture was of quality material, everything was all maintained. We enjoyed the table and chairs on the veranda, for both eating our on and just sitting and reading. The location was perfect for us, we liked being in a sunny area of the complex and enjoyed the swimming pool for cooling off. One couldn't find a better place to stay, peaceful, quiet, well maintained both the unit and the grounds. All of the people with the property management company were very professional. We give a 5 for our stay, conditions of property, location, property management. We will recommend it to our friends. This vacation rental was excellent. We stayed here for 6 days and loved it. The unit was extremely clean, air conditioned and well accommodated. They have all necessary items for the beach including beach chairs, umbrella, toys, etc. it is very close to a fantastic, family friendly, great snorkeling beach. We were able to see tons of beautiful fish, multiple sea turtles and a seal. It is close to multiple shops and excellent restaurants. In summary, I would return here in a heartbeat. We absolutely LOVED this condo. It had everything you would ever need for a Hawaiian vacation down to the relaxing massage chair that put me to sleep 3 nights in a row. We were so at home. I enjoyed cooking in the kitchen and was very happy with the cleanliness of the unit. It was the perfect vacation for this family of 4. Mahalo for sharing your beautiful home. We will definitely be back to gorgeous Kauai. My favorite island and will rent this same unit in the future. Our vacation rental was very clean and equipped with everything necessary for a perfect vacation. The house is in walking distance from beaches. The beach and the snorkeling equipment was very useful. 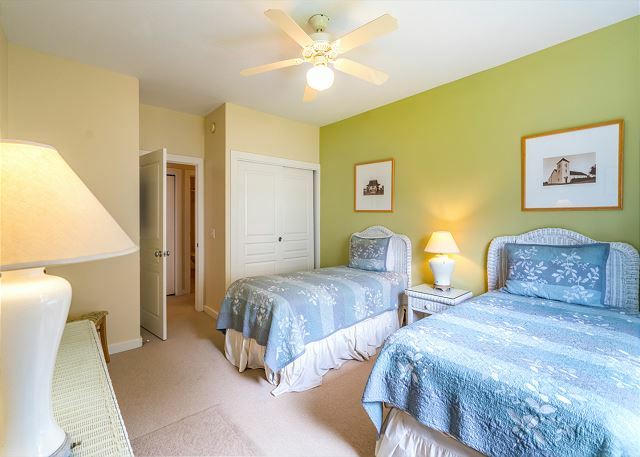 I recommend Regency -914 vacation rental for Kauai visitors. Immaculate, fully supplied, comfortable home away from home. We would return in a heartbeat. We (2 newly retired couples) had a wonderful time staying in this unit. We found it very clean, convient to lots of fun spots and lots of extras to make it feel like home. I would highly recommend staying here. We loved it. Thanks so much!! a guest from calgary, AB does not recommend this vacation rental. Good value, spacious and well equipped condo, walking distance to beach. Location not so great, looking out on parking lot and close to the road. Very nice place and exceptionally well-equipped. The computer was handy, the sand chairs were great, TVs were a bit complicated to operate, excellent massage chair, nice books, and a well-stocked kitchen. Fantastic unit! Very inviting, clean, and well kept. Lots of amenities - from spa tub, massage chair, and multi screen computers, to coded entry, nice little hand weights, scented hand soaps, an unopened dishwashing sponge, laundry detergent and some cooking basics (olive oil, salt, pepper, etc) that looked nice and new enough to actually use, even though they were already open. We really appreciated all the extra little thoughtful items. Ziploc bags too! I didn't notice this in the instructions that were sent but you do need to display a parking pass and you need to turn on the water heater. (We didn't see those instructions in the unit until after the first cold shower and a warning ticket in our car.). About 1/3 mile walk/jog to beach. Nice pathway for waking/jogging but when we had snorkel and boogie board, we drove. We loved our stay! We had a wonderful stay. The management company was extremely responsive. The home is well-stocked and made preparing family meals easy. It's just a short stroll from the beach and the pool area is close and very quiet. Just keep in mind it is a downstairs unit and you will hear the upstairs guests if that unit is being rented. Only one wasn't long enough! We had a fantastic trip to Kauai and were very satisfied with the condo. Everything was just as stated. The unit was clean and comfortable. Plenty of linens and the kitchen was well equipped. It was nice to have a computer and printer in the condo to print out boarding passes. We hope we can come back one day. Thanks for everything! The condo is even better in person. Great location, convenient 1st floor, plenty of seating and huge master bath. Wish we were there longer to enjoy relaxing in the condo. Loved the massage chair and the printer was great for printing our boarding passes. The management company sent detailed and accurate directions and instructions how to enter the property, thank you. We already recommended this condo and would definitely stay there again. Dishwasher didn't work, should have been checked before we got there. Other than that we enjoyed it. 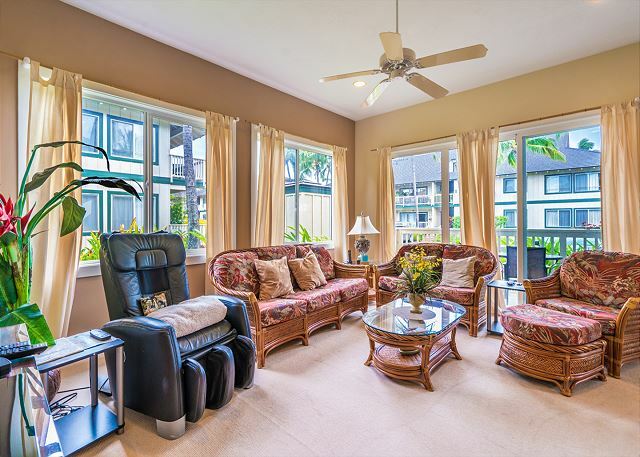 Great rental, close to the beach, just a quick 5-10 minute walk through beautifully maintained gardens and walkways to fabulous poipu beach. 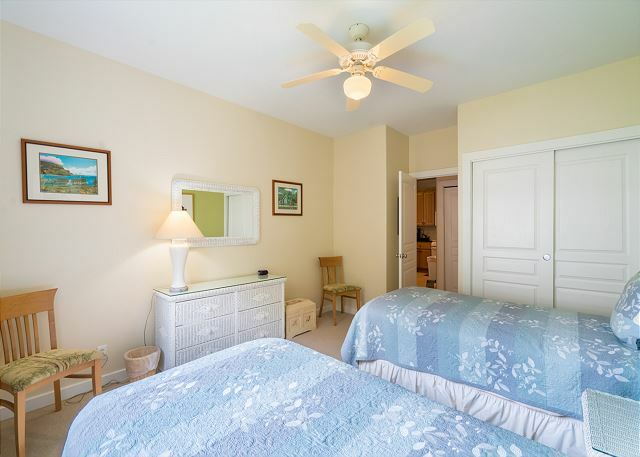 Tennis courts and restaurants are very close, on your way to the beach. The unit is very clean and has absolutely everything you need! Beach chairs and bogey boards! You won't want to leave this unit! Easy to get in and out of, upstairs neighbors weren't loud at all. We had a relaxing stay at the Regency at Poipu Kai. 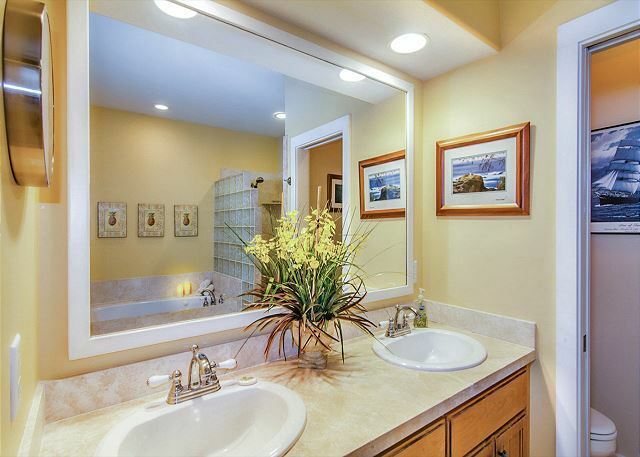 The property was as described, clean, and well-maintained. We had everything we needed to make our stay very comfortable. The condo is located in a very convenient area. 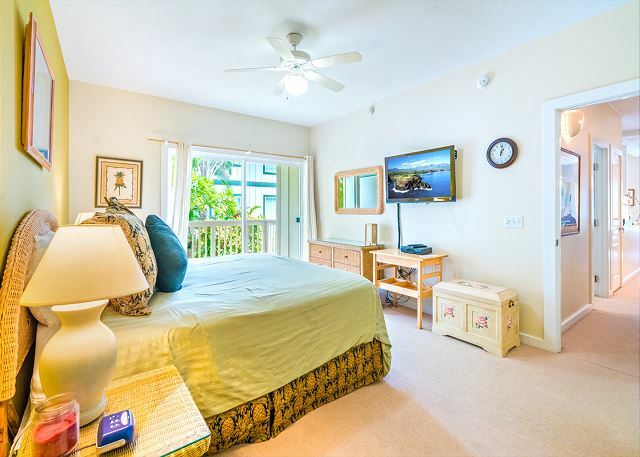 * location very close to Poipu Beach State Park, etc. The only cons for us were that the closest pool was closed for some construction, the pools in general were so-so, but why go to the pool when the best beaches in the world are 5-minutes away! The other thing to note is that you can hear the unit above you pretty significantly, although for us, they didn't wake us up since we were early risers and were overall pretty respectful. Facilities as good as advertised. Amenities were great and close to everything we wanted. Have stayed in Kauai over 10 times and will certainly use this unit the next time in town. Mahalo for writing such a nice review regarding your recent stay at the Regency #914. The team works very hard to exceed each guest’s expectations and it is a true pleasure to hear how much you enjoyed yourself! We look forward to your next visit! -Tamee D.
We spent 5 days at this beautiful condo. It is one of the largest, nicest we've ever rented and was spotless! The large kitchen had everything we needed. It was nice to have lots of condiments and spices available. Nice to have central AC and W/D. Location isn't the most convenient to swimming beaches, but we made it work. The condo looks exactly like the pictures -- beautiful! Thank you for the obvious care and attention to this property. Wonderful condo, immaculate with beautiful island resort furniture. Kitchen had everything. Washer/dryer with detergent and softener. Master suite is huge. Wonderful complex with nice pools and incredible landscaping. The closest pool was usually empty. Good location to enjoy beaches and sightseeing. Air Conditioning made our stay perfect, it was hot with little wind on several days. The management company was great, the lockbox jammed and they came out quickly to check it out. I recommend having a car to really explore the area and get to beaches and restaurants easily. Try Puka Dogs or Da Crack for lunch. Dinner at The Beach House, Keoki's and the many restaurants at Kukui 'ula. Fun shops in Koloa. Beautiful and Comfortable Condo with Everything you Would Need! This is a beautiful home with everything you would need. The air conditioning is definitely a great bonus. We walk and run daily, so distance is not a big deal, but the Condo itself is a long walk to beaches and restaurants. Shortest walk to any beach or restaurant is at least 12-15 minutes at a good pace, but hey its all a beautiful walk. One thing that made us give a 4 star instead of 5 was the fact that the main Lanai was 4 feet away from the parking lot, so if you sit out you will have a view of cars, and the building itself is the one closest to the road and entrance to the complex. It was still mostly quiet. There is limited parking and some parked in our reserved spot on a few of the nights making us search for a place to park, sometimes far away. There is no process for keeping folks from parking in your reserved spot. Again, a bit annoying but hey we were in Kauai so we didn't let it get to us. The main pool was closed because of construction, too many loud and not well behaved childrenat the smaller pools. Overall a great plce for the price, and we would stay there again. Very Clean and Well Stocked!! Great Rental! We rented this unit for our kids and sitter because of its proximity to the Grand Hyatt as we were staying there for a portion of our trip for business and we were very pleased. The property was super clean and very well stocked with anything you could need...from beach towels to kitchen gadgets to beach chairs and linens. Rental company was easy to work with and responsive (dishwasher made strange noise mid week and they had someone out within a matter of hours). Unit is located in Poipu area and property has a few small pools and hot tubs you can use. 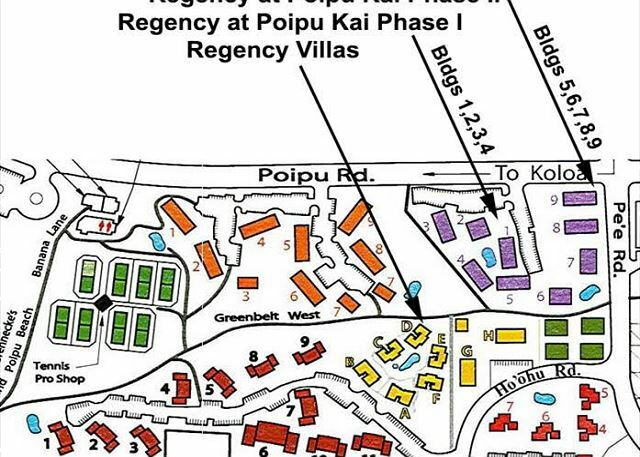 It is about an 8 minute walk along a paved path through the Poipu Kai resorts to Poipu beach. We would definitely stay here again!! We took my mother in law for her first trip to Kauai. 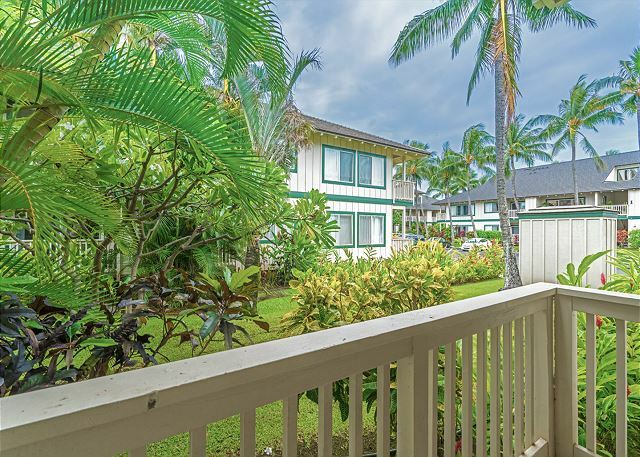 This 2 BR/ 2 BA unit was perfect, and the proximity to Kaumualii Hwy made it easy to go sight seeing in either direction, and the beach only a a short 5 minute walk from the building, the location is hard to beat. The unit was fully furnished, and the kitchen had everything we needed for our stay and the big bonus was the washer/dryer in the unit (which we didn't need to use). Felt like home. Appreciate the fully stocked kitchen and even laundry soap too. We loved the boogie boards. Added beach mats and float noodles for the place as well as condiments for the kitchen stock. Loved the boogie boards and beach chairs. The masage chair was amazing. Need to fix the cable connection in the living room. Very comfortable beds. Awesome AC. We would definitely stay here again. Felt like home. Mahalo plenty! The unit was completely furnished with top quality items which made the stay carefree. A short walk to the best beach and located in the best part of the island. I've visited the island several times and always chose Poipu; now I'll add this unit to my list. 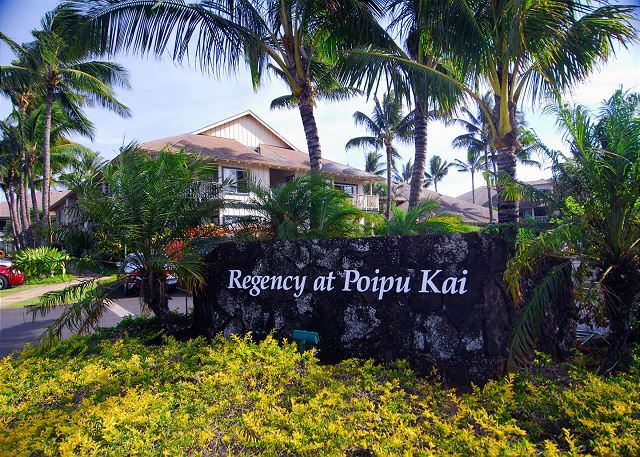 The Regency at Poipu Kai provided a central location for our adventures on Kauai. 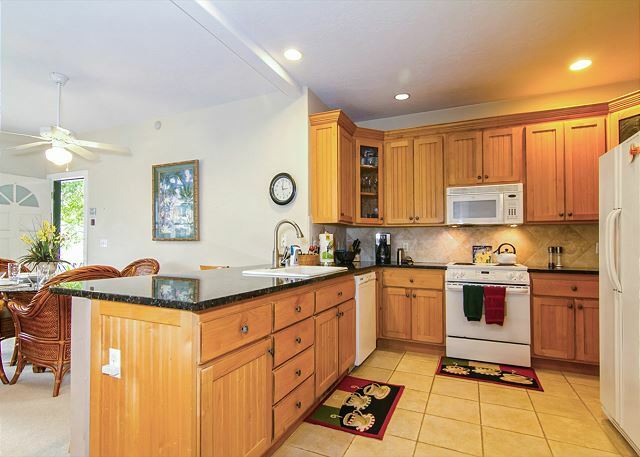 This two bedroom condo was very spacious, clean and contained all cooking utensils required to prepare a family meal. With two pools in the complex, a beach and small shopping centre with restaurants nearby, we highly recommend this property to couples our families wanting a quite beachside holiday location. This is a roomy condo with great fully stocked kitchen and nice TV and computer/wifi/printer. 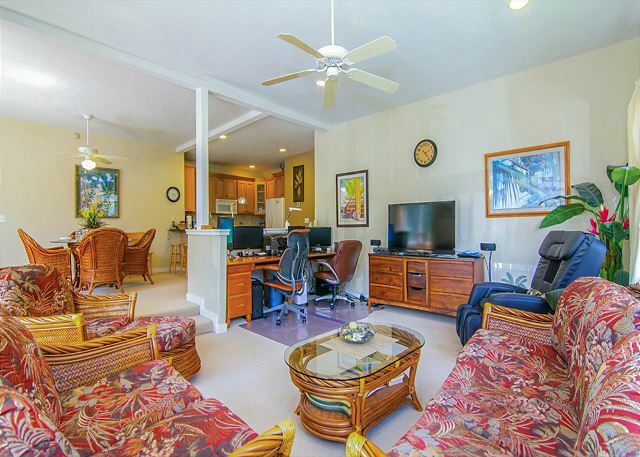 It is very well located in Poipu near two major shopping centers with many major restaurants. It has a washer dryer too. We recommend it for a family of four. From the arrangements to the stay, it was phenomenal. The place was GORGEOUS!! Even more than expected. Everything was perfect!! Regency | Aerial Flyby to Shipwrecks Beach from Kauai Media House on Vimeo.